Born Free operates our own service department for select repairs and warranty issues. The service department is open Monday through Friday from 7:00-3:30 Central Time Zone. Service work is scheduled by appointments only. You will be made comfortable in our customer lounge while your vehicle is cared for by our repair technicians. Coffee, soda, water, TV, magazines and restrooms are nearby for your comfort. Feel free to bring and use your laptop computer, as wireless internet is available in the lounge. Your pets are part of your family, and welcome in our lounge too! 3 years/36,000 miles bumper to bumper limited warranty. 36 months/36,000 miles limited warranty on coach construction (original purchaser only). Lifetime fiberglass limited warranty against corrosion or hail perforation. Appliances and some other components carry their own manufacturers' warranty. See appliance or component literature for specific warranty information. Reference "Resource Links" within our "Owners" page to obtain more information. 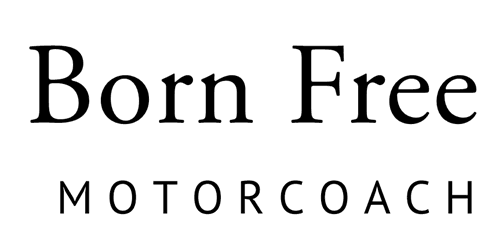 At Born Free Motorcoach our mission is to build the highest quality recreational and commercial vehicles in the market by combining craftsmanship, safety, drivability and durability. RV ratings have proven us to be successful since we have consistently received excellent ratings in many national RV ratings programs, including 4 and 5 star ratings for our motorcoaches from groups like RV Consumer Group (www.rv.org). In addition to these third party RV ratings we survey all new owners to gather detailed feedback related to improvement of our product and services. Our top rated feedback items for our purchase process include #1 treatment by our personnel, #2 vehicle condition at delivery, and #3 handling of questions after the purchase. Over 97% of our customers indicated they would recommend a Born Free Motorcoach to others, 80% indicated they "would strongly" recommend a Born Free Motorcoach. We are committed to achieving the highest level of customer satisfaction, not only through our product, but also through our relationships by treating our owners as members of our family. And, that special treatment goes beyond the purchase, to include superior service after the sale. In the unlikely event that warranty work is required, Born Free Motorcoach owners are able to select an RV Service facility that is convenient for them - whether at home or while on the road. The RV Service facility or the owner simply calls Born Free Customer Support for pre-approval of the work, and we will pay for it when billed. We also have an excellent repair service at our factory location in Humboldt, Iowa. We can handle all of your repair needs and can also assist with option installation and coach refurbishing. We staff our toll free number from 8:00 - 4:30 Central Time Zone Monday through Friday with telephone support personnel. Our customer service representative will try to answer your questions; direct you to service assistance in your area; and authorize warranty repairs by phone when the proper information is provided. This information will direct our phone support representative to information about you and your vehicle in our database to aid them during the phone call. To reach our Telephone Support Representative please phone 800-247-1835 and ask the operator for the Customer Service Representative. Born Free does not do chassis related warranty work. This work must be performed by Authorized chassis dealers. You can schedule this type of work locally, or our Customer Service Representative will be happy to put you in touch with the closest dealer near us, if you are visiting the factory for other service or warranty work. We are also not an authorized repair center for select appliance and TV repairs. Those repairs must be done by a dealer in their authorized service network. If you need help finding an authorized repair center, please call our Customer Service Representative for suggestions. If you are arriving early for a service appointment, there are electrical hook-ups available for you to use overnight for camping, free of charge. The (4) 15-amp, and (4) 30-amp service hook-ups are located just south of our Showroom and Offices, below the flag pole, and of course our campground located across the highway is available in the camping season. Our facility is located at Highway 169 North, on the East side of the frontage road. The physical address is 1505 13th Street North, Humboldt, Iowa 50548. We hope that repairs are never needed on your Born Free Motorcoach, but if the need arises, we stand ready to solve your problem as quickly as possible and make your visit to the factory an enjoyable experience.